Sharing pictures online is one of digital photography's killer features: copy a picture to your computer and it can be winging its way around the world at a rate the mainstream media can only dream of. As ever, though, you've got options. Different social networks offer different features when it comes to how they display your images, with non-photographic services such as Facebook and Google+ competing handily with the likes of Flickr and 500px. The big one. If you simply want your photos to reach your friends, Facebook is the social network to use, if for no reason other than it has 900 million members and you're likely to know at least a few of them. For socialites, Facebook's photo-handling has gone from strength-to-strength, and offers some spectacularly useful features including automatic face-detection. The drawbacks? Facebook's big strength is allowing you to reach people you already know, rather than being a social hub for meeting other photographers. Photographers with commercial aspirations should note that a Facebook page is a snap to set up and has a potentially behemothic audience. Google is the perennial bridesmaid when it comes to social networking, with Orkut and Buzz dying in undignified fashion before they could catch on. Still, Google's photographic heritage is pretty good - it still counts Picasa in its stable and, until it closes down on April 19th, online editor Picnik, whose features have been rolled into Google Plus's Creative Kit. Plus's editing features make it stand out, but more than anything we like its presentation: where others opt for relatively small thumbnail images, Plus gives you huge thumbnails and a well-implemented lightbox mode for viewing images in their full glory. Perhaps the most on-trend social network, Twitter is abuzz with celebrity photographers. It's recently become more photographer-friendly as well, allowing you to post images straight from the Twitter.com web interface, or from the iPhone's default camera app. It's a good way of sharing straight-off-the-camera shots, while some photographers share just-taken images from the field by sharing cameraphone pics of the backs of their cameras. The problem is that Twitter can be a fairly long game - if you don't know any influential Twitterers personally (and it's probable you don't), you may find that simply posting links to photos doesn't do much for your follower numbers. And, with no meaningful way of putting together an online gallery, Twitter's more a useful branch of social networking for photographers than a competitor for any of the big boys. Fun fact: Flickr has over 3,000 photos uploaded to it every minute. While that's still far less than Facebook (around six billion photos per month), Flickr is very much the photographer's choice. The ability to create public albums and sets, join photographic groups with common interests and see in-depth EXIF info from your fellow snappers, Flickr's far from a has-been. Flickr is all about community, and as such is a great place to learn and pick up hints and tips from like-minded photographers. Whatever you shoot, Flickr has a group for it. Flickr's also a great place for aspiring pros. While Google+, Facebook and Twitter all allow you to make your photos public, Flickr is not only searchable, but allows you to choose how your images are copyrighted, ranging from all-rights-reserved to the loosest level of creative commons, allowing anyone to take your images, modify them and re-publish them. 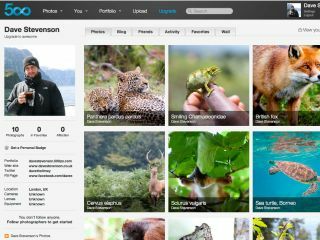 In 2009, Flickr teamed up with Getty images, allowing you to invite one of the world's largest image libraries to review your work and consider licensing it. Flickr's Pro account (£15 per year) allows you to upload an unlimited number of full-size JPEGs, making it a practical cloud backup option as well. Set for a redesign on 28th February, Flickr is doing a good job of keeping up with its competitors. 500px feels like a bit of an upstart, but in fact it's been running since 2003 (although only in its current form since 2009). Still, its userbase exploded this year, and if there's a better-looking site for sharing your photos with the masses we've yet to see it. Unfussy text, huge image previews and a distinct lack of clutter made Flickr look dated and crowded by comparison. And, while Flickr can be used as a kind of catch-all for your images, at 500px the emphasis is firmly on quality. "Choose only your very best photos," urges the upload screen, and free 500px accounts limit you to just 20 images per week. Paid for accounts, known slightly gratingly as "Awesome" accounts, allow unlimited options, and give photographers a bevy of useful features. For instance, you can link your 500px account to a third-party domain, allowing you to set up a domain website with a minimum of knob-twiddling. The ability to remove 500px's branding can also lend your portfolio an air of professionalism. The drawback is the price - at $50 (£32GBP) 500px is twice the cost of Flickr, and roughly what you'll spend on a decent web hosting account, albeit one with virtually no need for coding experience. Those looking for more of a sense of community might note that there's currently no way to set up or join a group, although 500px claims this is on its way. Currently, though, Flickr is still the place to be if you want to trade photos with a group of like-minded photographers. There's also currently no way of marking out your work as Creative Commons licensed, although professionals and semi-professionals will hardly object.